Thank you for sharing this pattern, Angie. You have been busy! Can’t wait to see the finished blanket! Lovely pattern and beautiful colours, you are a clever girl. Loving your page so uplifting, may have to use some of your colours, (hope you don’t mind) they look gorgeous! Merci beaucoup pour ces belles couleurs !! le noir fait tellement ressortir le travail ! gosh you worked that out quickly!! 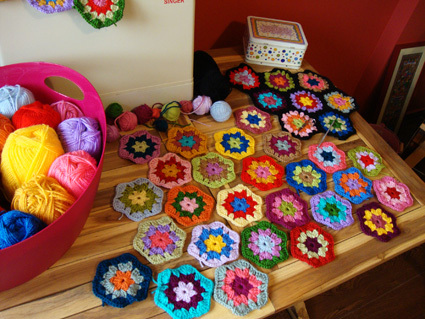 I’m new to hexagons but may well give it a try as it will be a challenge and a good way to use up odds and ends of yarn. Thank you for showing me how to do it, especially the way you do each row 26 times!!! The pattern looks great and not too difficult. Thank you for sharing it. I like the way you use your colours; the system is clear and simple. Have a great day! Well done Angie, I like the way you think, it is a very logical way to go about using all the colours evenly. I will definitely try this technique next time, as I often favour certain colours and end up using them more. Beautiful blanket as usual. Have a lovely day. Thank you for making the use of colors in this pattern so clear. I am often stumped when it comes to color scheme and amount of yarn used evenly and your explanation makes it so much clearer for me. I love your creative ideas and you crochet so beautifully, not to mention the pictures are really spectacular. Your are a real inspiration. Thanks for a great pattern and sharing how you use your colours evenly. 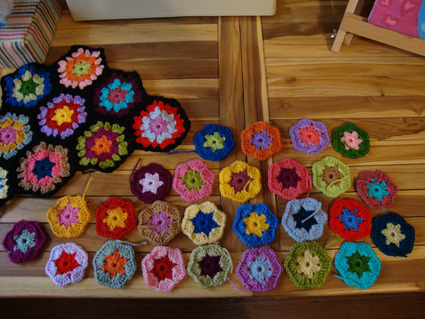 I recently made some granny squares and found I ran out of some colours and was left with lots of others – so maybe I need to adopt your way of working!! I would like to work on a blanket for my living room; this may be the one! Thanks for the pattern. Hi Angie, you are a crochet machine! That’s for sure!! Thanks once again for the lovely pattern and wonderful inspiration. I love your blog. Angie thank you, thank you for the graphic. You are wonderful!!!!. Kisses. Andrea. His works are beautiful, congratulations! Thank you for sharing this. I like that you told us EXACTLY how you do it. Wonderful! It’s going to be so pretty. This is wonderful!!! Thank you!!! I love your work and your tips about using every colour for the first round and so on, now why did I not think to do that, lol. I’ve never used the grafics just the old fashiond method but I must learn so I can try your patterns out as they are so nice. I look forward to seeing more. Thanks for the pattern and the yarn color tips – you amaze me!! So colorful and so vibrant. Lovely, lovely work! Thank you so much for sharing this lovely pattern! Oh wow, such pretty again! I love the colors and the pattern looks indeed great… Have a sunny weekend! I have fallen in love with, love at first sight! I was wondering how much wool to buy to make a blanket. you make up 26 at a time is that from 50grams or 100g balls? does 26 use up the whole ball? It would be great if you could up date me on this so I don’t over or undert spend. Thanks so much for the info, it’s really helpful. 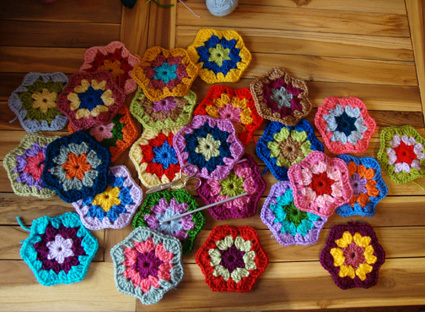 do you join the hexagons with the half treble, boarder or do you hand sew with needle and yarn? I am off to shop for 26 colours, woohoo! Thank you so much for all the yummy color inspiration!!! Must ask tho, black border would be the 4th row around each one, or do you use the half treble stitch to join and how would you do that? 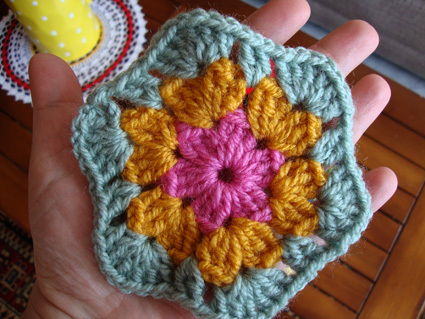 Also a fairly newbie to the whole crochet thang… would love to be able to get your results. Thanks for letting us know how you choose your colours, that really sounds fun, and your hexies are very beautiful. 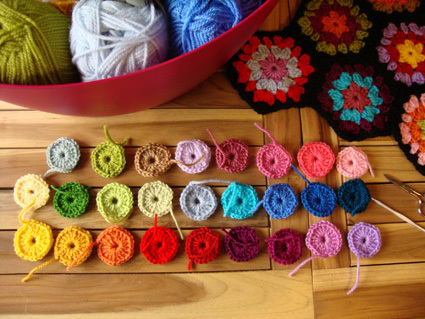 What I didn´t understand is the last row on your graphic pattern, the one outside the half treble crochets, is that just to show where to sew the hexagons together? Or do you join by crocheting? Te encontre por otro blog que publico tu nombre y tu arte. Me enamore yo tambien!!!!!!! Te felicito por el buen gusto. Gracias por compartir. Besitos desde Buenos Aires. b.e.a.u.t.i.f.u.l. I love this pattern! Simply gorgeous! You did a perfect job! I really loved your tip for “unique” hexagons and I am using it for my blanket. 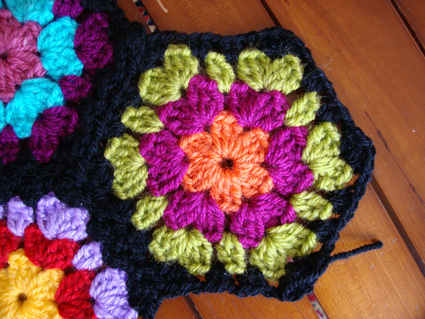 I have mentioned you in my blog at http://crochetkari.blogspot.in/2012/05/state-of-hexcitement.html. Do visit me and let me have your comments. Also let me know if you have any tips for improving my blog. I really like your blog and the gorgeous colours you use. All of my great-grandmother’s (very colorful) afghans are joined with a half row of black. They are the most treasured heirlooms in our family, because the contrast is so striking and the style – totally her. thank you so very much for the pattern of love at the first time…..paulette. Where do I find the Pattern????? I don’t see where the instructions are on how to make it. Do I just find out how to make a Hexagon and then put in as many colors as you have? Doubles and the next stitch . I need help and I see all of the other patterns are guess work also. I couldn’t find the pattern for the hexigon. Did I miss something here? I need the written pattern for this. I cant do it using the diagram. I have to practice that way. Thank you. These are lovely! Can I ask, what is the yarn that you used? I’m here in the US, but I’m hoping I can get my hands on some. 🙂 Thank you! thank a lot for this tuto, this blanket is so nice, I began this week-end and it is very funny to make it. But how many pieces do I need for this blanket, in total? And how many pieces for the shortest side? (sorry for my bad English). You have so beautiful ideas in crochet, I am so happy to have found your website, really!!! Have a very nice day, here in Belgium it’s raining…. Bye bye! 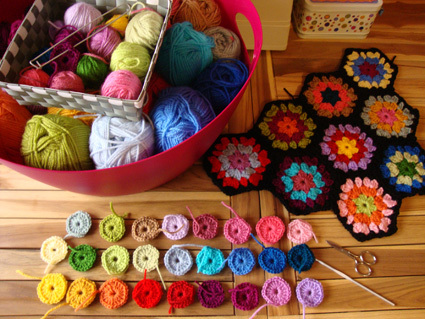 Have you ever made a poncho out of these hexagons or granny squares? I think it would be lovely!! Point me to a pattern if you’ve done them. 🙂 I absolutely love your work. 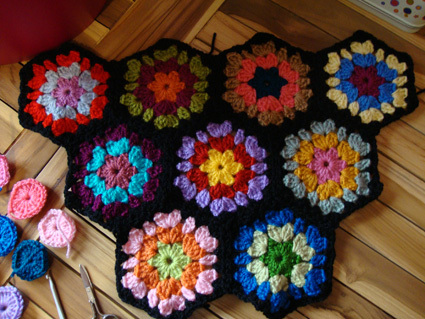 It’s rainy & cloudy here today, and your colorful crochet has brightened my day. thank you! Would you please be kind enough to write this pattern out in American? 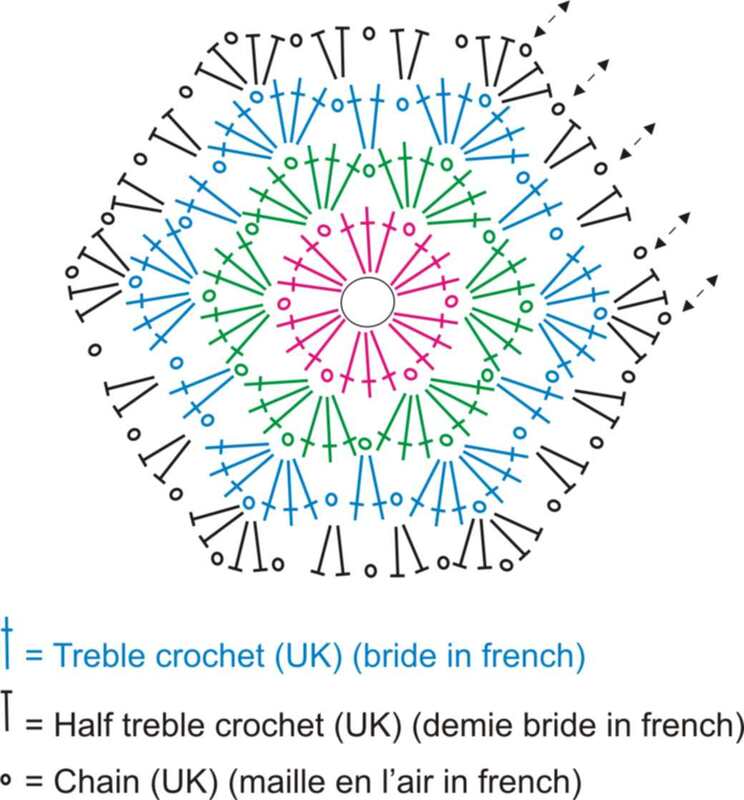 It is so wonderful, that I want to share it with my crochet circle here in the States. Thank you. j’ai déjà fait à peu près 40 pièces de ce plaid, ça avance tout doucement, mais quel plaisir! Pour ma part, je fais les bords en couleur “ficelle”. FROM LAS VEGAS, NV DONNA K.